A brachial plexus injury can have a devastating effect on upper limb function. Traumatic brachial plexus injuries, which are most commonly sustained in high speed motor vehicle accidents or sporting events, are characteristically complete, and affect the sensibility and muscle power of the entire extremity. Those that occur at birth tend to be incomplete, and affect the shoulder and elbow more often than the hand. In either case, the extent of spontaneous nerve recovery is unpredictable and generally imperfect. Frequent and thorough examination over the first three to six months following injury is necessary to document signs of nerve recovery, and additional imaging or electro-diagnostic tests are often required. Over the past three to four decades, great strides have been made in surgical reconstruction of injured nerves, and a tremendous amount of research is underway to unlock the complexities of nerve regeneration. 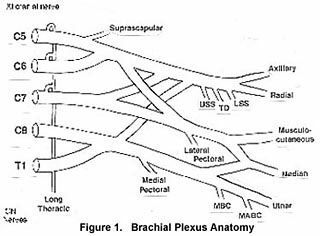 The brachial plexus refers to a complex web of large nerves that exit from the spinal cord in the neck, and direct the movement and sensation of the entire upper limb (Figure 1). The nerves divide and join repeatedly before terminating in several peripheral nerves that branch out to supply the muscles of the shoulder and upper limb. Each nerve root has contributions to several peripheral nerves and vice-versa, and that contributes to highly variable patterns of injury. The plexus is located immediately above and below the clavicle, or collarbone, and the peripheral nerves begin approximately at the level of the shoulder joint. The brachial plexus is generally injured by a traction, or stretch mechanism, such as when the shoulder and helmet of a motorcycle driver are forced in divergent directions in a fall. Frequently, associated and life-threatening injuries to the head, long bones, and internal organs will require more urgent treatment, and delay the diagnosis of brachial plexus injuries. Approximately 15% of brachial plexus injuries have an injury to the blood supply of the arm as well, and emergency surgery may be indicated. Before 1960, surgical reconstruction of brachial plexus injuries had been all but abandoned due to its highly complex nature, and dismal surgical outcomes. Surgeons in Europe and Asia pioneered new techniques in microsurgical nerve reconstruction to facilitate nerve repair, and documented successful nerve grafting procedures to restore muscle function. In patients with previously irreparable nerve injuries, transfer of a normal working nerve to the injured muscle was found to have the capacity to restore function to the paralyzed muscle. Surgeons at Hospital for Special Surgery have been using these techniques for over a decade to reconstruct these difficult injuries and restore function to previously flail limbs. Nerve reconstructive surgery is ideally performed within the first 3-6 months after acute injuries to permit optimal recovery, allowing time for the regenerating nerves to connect with paralyzed muscles before dense scarring develops. For those with injuries that occurred more than six months ago, new techniques have enabled our surgeons to transfer working muscles with their blood and nerve supply from distant parts of the body, enabling lost elbow flexion and shoulder motion to return. Recovery from brachial plexus surgery is measured in months and years rather than days or weeks, beginning with a flicker of muscle recovery at 6-12 months post-op, and progressing to a gradual return of strength and mobility. Our rehabilitation team employs state-of-the-art techniques, including electric stimulation, biofeedback and pool therapy to maximize recovery. The multi-disciplinary approach at Hospital for Special Surgery allows us to combine the talents of advanced anesthetic, rehabilitation, and pediatric teams for diagnosis and management of peri-natal brachial plexus palsy. In most cases, newborns with brachial plexus palsies will begin to recover within weeks of birth, and surgery is rarely necessary. If no recovery has occurred within three months of birth, we can perform additional testing under light anesthesia as an outpatient to help determine the extent of nerve and spinal cord involvement. If there is evidence of complete nerve disruption, surgery can be safely performed as early as 3-6 months of age to repair or graft injured nerves. Physical therapy is critical to sustain range of motion to each of the joints in the injured limb during the observation and postoperative periods. In an older child with incomplete recovery, tendon transfers are an extremely effective means to restore balance and function to the shoulder. As a rule, children have the best regenerative capacity after brachial plexus injury because of the plasticity of their neural tissues, their boundless optimism, and their will to recover.